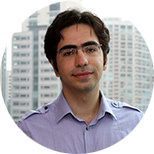 Alireza Vahdatpour joined the Post-Graduate Fellowship program in 2010 and worked with two research teams while at IHME: Optimal Resource Allocations and Verbal Autopsy. His research involved direct estimation of cause-specific mortality fractions from verbal autopsies and verbal autopsy analysis using the random forests method, an innovative computer-coded approach to improving assignment of cause of death. Upon completion of his fellowship, he joined Microsoft as a Research Software Developer Engineer for the Bing search engine, working on terabyte-scale machine learning and data-mining solutions. Vahdatpour A, Amini N, Sarrafzadeh M. On-body device localization for health and medical monitoring applications. PerCom 2011: Ninth Annual IEEE International Conference on Pervasive Computing and Communications. 2011 March 21-25; Seattle, USA. Vahdatpour A, Sarrafzadeh M. Unsupervised discovery of abnormal activity occurrences in multi-dimensional time series, with applications in wearable systems. 2010 SIAM International Conference on Data Mining. 2010 April 29-May 1; Austin, TX, USA. Vahdatpour A, Amini N, Sarrafzadeh M. Toward unsupervised activity discovery using multi-dimensional motif detection in time series. IJCAI-09: 21st International Joint Conference on Artificial Intelligence. 2009 July 11-17; Pasadena, CA, USA. Dabiri F, Vahdatpour A, Noshadi H, Hagopian H, Sarrafzadeh M. Electronic orthotics shoe: preventing ulceration in diabetic patients. IEEE-EMBC 08: 30th Annual International IEEE EMBS Conference. 2008 Aug 20-24; Vancouver, BC, Canada. Wu W, Au L, Jordan B, Stathopoulos T, Batalin M, Kaiser W, Vahdatpour A, Sarrafzadeh M, Fang M, Chodosh J. The SmartCane System: an assistive device for geriatrics. BodyNets 2008: Third International Conference on Body Area Networks. 2008 March 13-15; Tempe, AZ, USA.